GENADY IVANOVICH LARISHEV, born 1920, was sixteen when he first came into contact with the Fedoskino School of Miniature Painting. He is now one of the most distinguished Fedoskino Masters drawing his images directly from nature. "That Oak Tree greening by the Shore; I sat beneath, and of his Lore; The Learned Cat would chant and read. One Tale of these I kept in Mind, And tell it now to all my Kind...", so reads the famous preface to PUSHKIN's poetic tale of 'Ruslan and Liudmila'. In Russian it is called "Lukomorye", and it gives many hints at the fantasy world of Alexander Sergeievich Pushkin (1799 - 1837) and his romantic fairy tales. Here, Marina ROGATOVA of FEDOSKINO has expanded the scene by adding the backdrop of a Russian village, the villagers gathering at dusk, with sheep grazing in the field as the friendly witch 'Baba Yaga' flies-by overhead with her broom. - This most unique composition is rendered in soft pastels and subtle detail on this fine Russian Lacquer Miniature. "The Fair at Sorochinsk" by Aleksey KORCHAGIN. and in Technique. While employing a very limited colour palette, a borderline monochrome, the painting is exceptionally detailed, giving each small scene almost three-dimensional depth. Restrictions on creativity and experimentation that were imposed during the 1960s and 1970s in Soviet Russia were lifted in the late 1980s, and FEDOSKINO art emerged unscathed. Not bound by the strictures of egg tempera ICON Painting tradition as are their colleagues in the other three Russian Lacquer Art Centers of PALEKH , Kholui and Mstera, the Fedoskino artists are now experimenting more and more with the form of the papier-mâché blanks, as well as with new painting techniques and special effects. While looking toward the future from the top of the Fedoskino Art School building, one must also gaze upon the old buildings of the 19th century Lukutin workshops, which are still standing today. 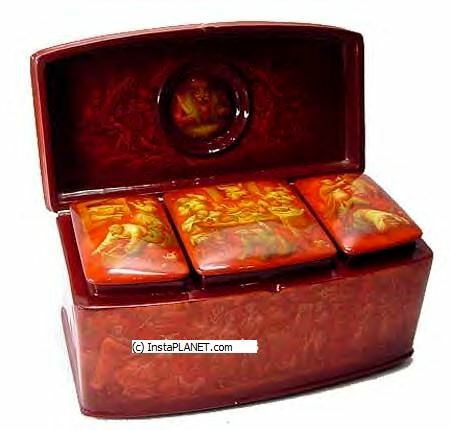 It is this enduring combination of old and new, together with the turbulent history of Russia herself, that makes Федоскино (Fedoskino) Russian Lacquer Art unique in the World. For an illuminating introduction to the origins of Fedoskino miniature painting, InstaPLANET suggests reading the Artrusse Fedoskino page.